Short Info: The Bihar Vidhan Sabha has successfully invited the applicants to fill up the 157 posts of Stenographer, Reporter, Personal Assistant, and other various vacancies. Now, it is going to conduct the Bihar Vidhan Sabha Examination 2018-19 on 21st Feb 2019 to 24th Feb 2019 for Reporter and on 25th Feb 2019 to 1st Mar 2019 for PA and for Stenographer, an examination will be held on 2nd Mar to 5th Mar 2019. All applied candidates have to appear in the written examination. To participate in the written examination, they all have to carry their admit card on the exam day. Candidates will be able to download their admit card from the official website to download before almost 15 days of examination. They need to provide some required asked information like login id and DOB etc. The admit card will appear on 10th Feb 2019. BSSC Vidhan Sabha examination 2018-19 is to be held on 21st Feb to 5th Mar 2019 for various posts. All applied candidates have to perform in this examination. For that, they need to carry their admit card with them. 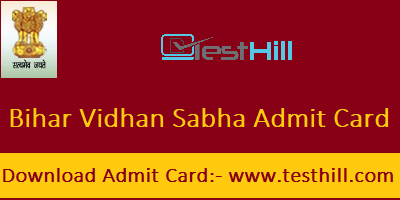 The admit card is a key to partake in the written examination. Because without the Bihar Vidhan Sabha admit card, the applicants will not be able to get entrance the exam hall. Call letter contains some important data about the applied candidate and examination. So, by the admit card, the guard of the entrance gate can identify the applied candidates. So, every applied competitor need to bring Bihar Vidhan Sabha Admit Card 2019 with him/her. Aspirants need to go to the official website in respect to download hall ticket for various posts from there. The authority will not send it to anyone’s house. So, they have to download it themselves. They have no other choice because only that admit card will be allowed which will be downloaded from the official website.